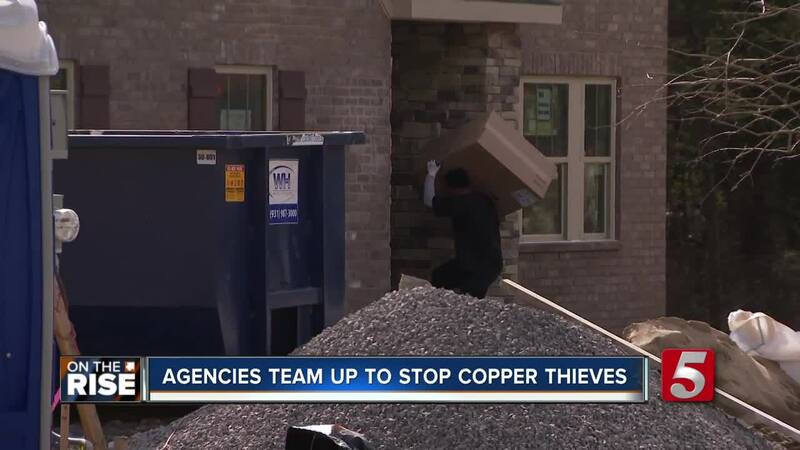 NOLENSVILLE, Tenn. (WTVF) — There is a collaborative effort from multiple agencies across the mid-state to crack down on thieves stealing copper from new residential construction sites. Detective Christmas Gillman of the Nolensville Police Department said the effort has been going on for the past few months as new neighborhoods are being developed. She added that there is a focus on one specific group suspected of committing countless copper thefts in several jurisdictions. "We're all sharing information and hoping we can crack down on who is doing this," Gillman told NewsChannel 5. "We look at what similarities there are, time frames and areas, and try to map out what happened and then be able to figure out what our next step is." With at least five subdivisions under construction in Nolensville, Gillman said the problem of copper thefts became noticeable during the summertime. The cost of damage is at least $50,000. Other types of theft also increased within the last several months. "We've had washers, dryers, water heaters, microwaves, they've even taken the toilet paper handles out of the bathrooms, the towel hangers, you name it, doorknobs, just a wide array of whatever they can find," Gillman said. In Mt. Juliet, there were barely any reports of copper theft in the first six months until September when there were 14. A Mt. Juliet police spokesperson said the city always had a lot of continuous neighborhood construction but that it could be thieves needing to move into a different area. Gillman said her department continues to patrol areas hardest hit and speak with construction managers. She urges them always lock the home.